– In 2015 We Had ONE! A first sign of improvement could, however, be the record €5bn German Venture Capital funds raised in just the last 18 months. This cash war chest will, however, need some time to filter through the equity funding chain. The Ministry of Economics apparently shares our concerns and initiated a research project tackling the general lack of equity funding in Germany at the beginning of 2015. As part of of the research the ministry hosted a roundtable with senior German business personality in order to discuss, how things can get improved. As a result of the roundtable the Ministry has publicly announced an annual IPO target of 15 to 20 for Young German Growth Companies inlcuding some measures how to get there. Where Do We Currently Stand? At that time we thought a target of 15 to 20 would be fairly low compared to for instance the UK. We have decided to double check. Before starting our research, we needed to clarify two things, which the publication of the Ministry of Commerce has not clarified. Criteria I: What is Growth? Criteria II: What is Young? We are defining a company as young, if it has been started less than 10 years ago. This is in line with the German Startups Association. The average time to IPO for VC backed companies in the US is 8 years. ONE IPO from a young growth company in 2015. Expanding our research horizon does not help either. 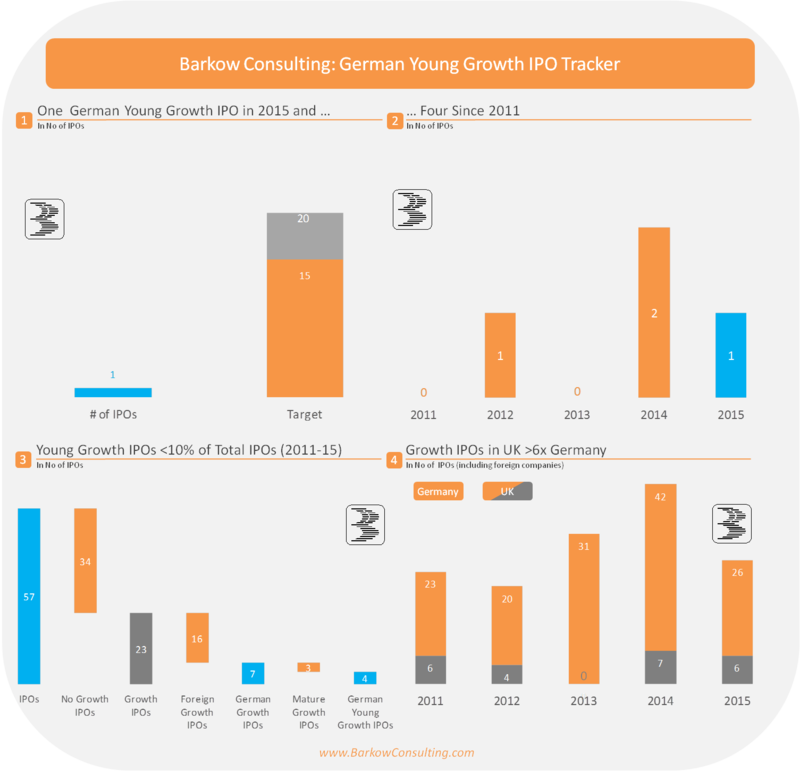 During the last five years, 7 German growth company successfully IPOed, four of which can be considered young in line with our above definition. In other words, the current run rate for German growth IPOs is less than two per annum; the run rate for young German growth IPOs less than one. Against this background a target of 15 to 20 seems quite a stretch. As a reference: The number of growth IPOs in the UK is more than 6x higher than the German equivalent (both numbers including IPOs of foreign growth companies). At the same we have identified 8 private IPOs in Germany in 2015. The term private IPO refers to a venture capital funding round of at least $100m. As German VC investments and fund raisings have reached post crisis highs, there maybe hope for the future!